The moment I read this blurb Quantum Physics meets Bible and Vedas in Background of Kashmir and Cricket I was curious to read this book. Just few days back I was lamenting on my Facebook page about how Indian fiction has the same run of the mill kind of stories and how I am dying to read something un-put-down able . And here I get the answer in the form of this book! You can view the official trailor of the book HERE to see what the book holds in store for you. To be honest sci-fi is a genre I usually stay away from for I somehow cannot connect with it except ofcourse Dan Brown’s books. I enjoyed reading the Krishna Key by Ashwin Sanghi but then after that no other author in this genre could catch my attention for long. Having heard a lot about this book on the internet and reading its reviews I was very curious to read it when Nimi from Readers Cosmos came up with this review program. I immediately grabbed it! When I read the blurb and all I was curious as I kept on wondering if really Indian fiction has finally got its own sci-fi author. The book is truly very well written when it comes to the detailing of characters and the plot. It is intriguing and ofcourse being the first in the Svastik trilogy it sets out a certain level of expectation for the reader from coming up titles in the series. Baramulla as a place is very known thanks to the activites that bring it to news time and again. 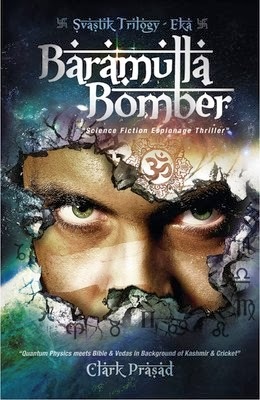 And adding the word bomber to it makes it catchy title too good to ignore if you catch it on the racks. The author has done a truly commendable job in this book by handling the nuances of science fiction mixed with history, mythology and facts with perfection. The narration is very gripping making you turn page after page as you keep reading this pacey thriller wanting to know what is going to happen next. The author has done an exhaustive research behind this and it shows when you hold the book in your hands. Not at any point did it feel boring or out of context. Rather it was constantly a moment of anticipation. It is like reading a history book but without being taught about the boring details. Being told about mythology but in a manner that you would keep saying then? Long after the narrator is done narrating the anecdote. Highly recommended for all sci-fi lovers, it is a thoroughly enjoyable read! 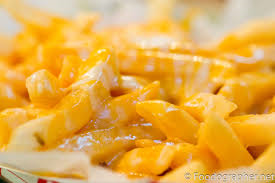 This book is like cheesy French fries- delicious, crunchy, cheesy, yummy, melts in the mouth and you just want them to never end! P.S: A special THANKS to Nimi - Readers Cosmos for sending this book for review!